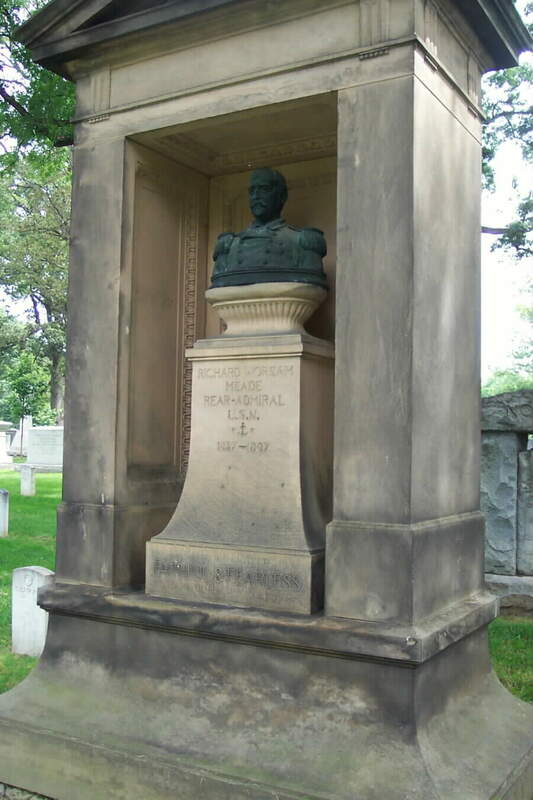 Born at New York City, October 8, 1837, the son of Richard Worsam and Clara Meigs Meade, he graduated from the United States Naval Academy in 1856. He was commissioned a Lieutenant, U.S.N., 1858 and was assigned to duty as an ordnance instructor to the receiving ship USS Ohio, Boston, 1861. 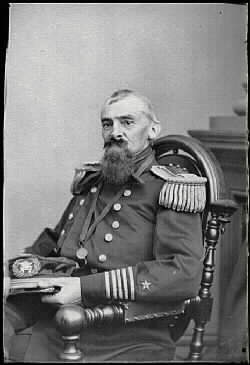 He was promoted to Lieutenant Commander in 1862, and was in command of the ship USS Louisville on the Mississippi River, 1862; head of the Steamship Department, Naval Academy, 1865-68; commissioned Commander, 1868; prepared Manual of the Boat Exercises of the Naval Academy, 1868; promoted to Captain, 1880; Commandant, Washington Navy Yard, 1887-90; promoted to Commodore, 1892; Naval Representative at the World Columbian Exposition, Chicago; promoted to Rear Admiral, 1894, in command of the North Atlantic Squadron. 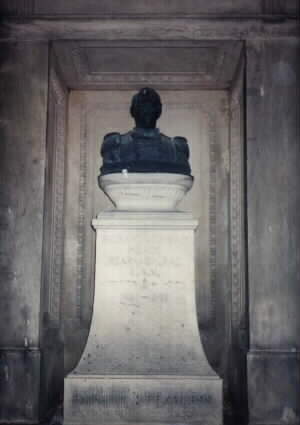 His retirement before the age limit, resulted from a disagreement with the Navy Department concerning the way in which he had been treated officially. An article which appeared in the New York Tribune represented Admiral Meade as criticizing the administration and using the sentence "I am an American and a Union man, two things this administration can't stand." Subsequently when Secretary Herbert asked him to affirm or deny this statement, he returned a non-committal answer. Soon there were rumors that he would be court-martialed for disrespect to the President, whereupon he requested his retirement. President Grover Cleveland, in granting his request, censured his conduct. an Operation in Washington for Appendicitis. 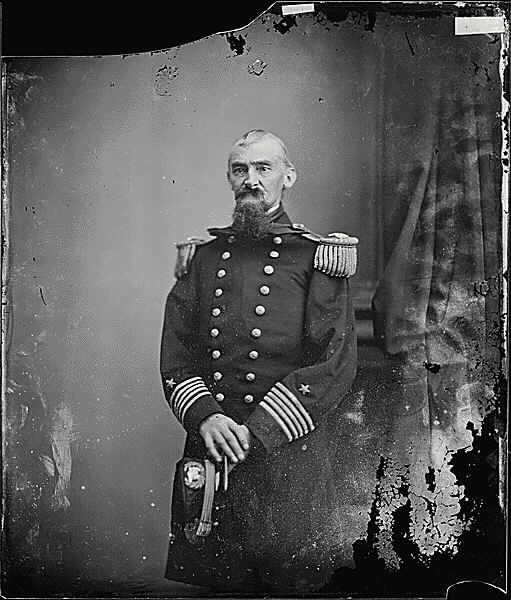 WASHINGTON, May 4.--Rear Admiral Richard W. Meade, (retired) United States Navy, who had been ill in Washington for three weeks, died to-day at Mr. Johnson's private sanitarium. He had been ill with the grip, and was recently attacked with appendicitis. An operation had to be performed, and from its effects he failed to rally. The funeral will be held at Miss Patterson's home, 1,110 Vermont Avenue, and the interment, with military honors, will be at Arlington. 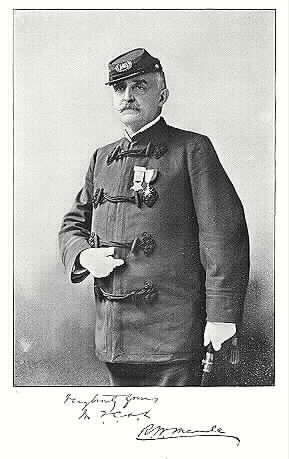 Rear Admiral Richard Worsam Meade, known as on of the most gallant commanders of the United States Navy, was born in the Ninth Ward of New York City on October 9, 1837, and his naval career began October 2, 1850, when he was appointed a midshipman from California. After spending three years at the Naval Academy, on the practice ship Preble, and on the steam frigate San Jacinto, he was ordered to the sloop-of-war St. Louis, and while serving on board that ship was present at the famous Martin Koszta affair, of which the following is, in part, his own version: "We had been cruising in Levant for some time, and on June 23, 1853, cast anchor off the City of Smyrna. The American Consul at that port, Mr. Offley, presently ame aboard and informed us that one Martin Koszta, an alleged American citizen, had been kidnapped two days before by order of the Austrian Consul, and was at that moment in irons on board an Austrian man-of-war lying in the harbor. About an hour later a delegation of residents of Smyrna, chiefly English subjects, came aboard and begged our commander, Ingraham, to take some action regarding Koszta, whose offense, though purely politcial, would probably cost him his life. "This statement sufficed. Our commander had his gig manned, went aboard the Austrian brig-of-war Hussar, and asked to see Koszta. I was with him. Some discussion took place, and it was evident that the Austrian officer in charge attempted to evade the request. The demand was thereupon made peremptory, and was complied with. Ingraham insisted that during the interview Koszta's irons should be removed, and this was also conceded. The prisoner then informed us that, although he was not a full citizen, he had taken out his first papers after a residence in the United States of two years, and when the prescribed time had expired would take out final papers. "For the next few days a spirited correspondence ensued between the Austrian and American officers both on land and at sea, when finally the Austrian Consul announced his intention to send Koszta to Trieste by the next steamer. The American Consul made a formal protest; but Ingraham was not satisfied with diplomacy. He simply heaved anchor, bore down on the Hussar, and sent word to the Austrian commander that Koszta must not be removed until the American Charge' d'Affaires at Constantinople had been communicated with. All this, too, in the face of the fact the the Austrian force in the harbor consisted of two men-of-war and two one-gun merchant vessels, while we had just our old sloop, with 20 guns and 220 men, against their 33 guns and 550 men. But Ingraham meant business, and the Austrians quickly realized it. After considerable delay, we were advised by Mr.Brown, our Charge', that, as Koszta was not a naturalized citizen, whatever we did for him must be done on the grounds of humanity and not of legal right. Thus, all the responsibility was thrown on Ingraham, and he promptly assumed it. Early next morning he made a demand on the Austrian commander for Koszta's surrender by 4 in the afternoon under pain of forcible seizure if the demand were refused. The Austrian did refuse, however, and the other man-of-war, the Artemisia, a twelve-gun schooner, fitted with sweeps, bore down on us and placed herself across the bows of our ship, ready to pour in a raking broadside. We immediately started to prepare for action, but while we were doing this negotiations had been going on between the Austrian Consul and the commander. Shortly before the fight was to commence we received a message from the Austrian commander suggesting that Koszta be turned over to the French Consul pending a settlement of difficulties by the Governments of Austria and the United States. To this Ingraham assented, much to the chagrin of the Austrian. However, our erstwhile foe did not long bear malice; for on the Fourth of July, two days after the incident, he hoisted the American colors, just as if nothing had happened." At the outbreak of the civil war Meade was detailed as an instructor in gunnery on board the receiving ship Ohio, and later served as executive officer on the steam sloop Dacotah of the North American blockading squadron, and on the Conemaugh of the South Atlantic blockading squadron. In 1862 he was commissioned Lieutenant Commander, and was placed in command of the ironclad Louisville. Becoming disabled while engaged in breaking up guerrilla warfare on the Mississippi, he was in December of the same year sent East as an invalid, and on his recovery he was assigned to the command of the steamer United States, which was sent in chase of the Confederate privateer Tacony. Meade commanded the naval battalion during the riots in New York in July, 1863, and succeeded in maintaining order in his district. His next duty was on board the gunboat Marblehead. While in command of that vessel he took an active part against the enemy, and rendered efficient service in conjunction with the troops of General Gillmore. He especially distinguished himself when the Confederates, under Kemper, made an attack from John's Island earthworks, with the intention of driving off the Marblehead by a heavy artillery fire. The Marblehead's crew consisted of seventy men. After a sharp fight of over an hour the Pawnee and the Williams came to that vessel's aid, and the attack was repulsed. The Marblehead was struck thirty times, and many of her rew were killed and wounded. He commanded the Narragansett from 1871 to 1873, and was especially commended by the Secretary of the Navy for "great judgment and skill" shown in negotiating a commercial treaty with the Samoan Islands. In July, 1883, he was made Captain, and put in charge of the New York Navy Yard, and four years later was transferred to the Washington Navy Yard as Commandant. In 1892 Meade was commissioned Commodore, and in 1894 be became Rear Admiral. In May, 1895, troubles which had existed between Rear Admiral Meade and the Navy Department became public. There had been various unpleasant incidents, causing unfriendly feeling, including a dispute between the Rear Admiral and the Consul at Curacao, and the affair of a fleet surgeon who had refused to answer an application for help from a merchant vessel. It was said at the time that Meade was a constant sufferer from wounds received during the civil war, which increased his natural irascibilty. He complained to the newspapers of the conduct of the department in ordering most of his squadron, including his flagship, the New York, to the Kiel Canal celebration, and the refusal to let him have the Cincinnati in her place. On the 9th of May he had his pennon hauled down from the New York and left the ship, having sent in his request to be relieved from command, and announced his purpose to ask to be retired under the forty years' service provision. His retirement for age would not have been due until October, 1899. During the interval between his ceasing duty and his formal retirement, he publicly and bitterly criticized President Cleveland and Secretary of the Navy Herbert. The expression which gave special offense was, "I am an American and a Union man -- two things this Administration can't stand." There was serious talk of a court-martial for his language, and more of the same general kind regarded as being in disregard of disipline. No such action was taken, but he was placed on the retired list. WASHINGTON, May 6, 1897 – Rear Admiral Richard W. Meade was buried at the National Cemetery at Arlington today, after appropriate services at church and the grave. Solemn high mass was celebrated at St. Aloysius Church at 11 o’clock. The honorary pallbearers were Admiral J. G. Walker, Colonel Henry Heywood of the Marine Corps, Commodore Norten, Commodore Dewaye, Captain Farquhar, Captain W. S. Schley, Captain Crowninshield and Dr. Philip G. Wales. A battalion of Marines from the Washington Barracks under command of Captain E. B. Robinson, and a delegation of twenty-five members of the Lafayette Post of New York City, escorted the body to Arlington, preceded by the full United States Marine Band, led by Professor Fanciulli.